SmartOmi brings in truly wireless earbuds which do not have any wires between the two buds. With the 3.5mm jack disappearing in many phones these days especially iPhone, earbuds have become necessary and their demand has only increased. They offer the same functionality as the Air pods (manufactured by Apple) but at the price almost half at which they are available in the market. 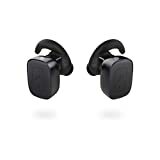 Genuine SmartOmi Q5 True Wireless Earbuds: feel free to enjoy crisp stereo music without the annoying wire when doing sport. The soft ear tips provide secure fit and avoid falling out during workout, fitness, exercise, running or gym. You may also share music without tangle wire. Light Weight and Better Voice Quality: unbelievable light-weight with no burden to ears, the 8mm built-in microphone realizes clearer calls for you and the other side.You can mute/unmute your microphone during a call by double pressing MFB of the left earbud once. Snap Pairing and Superior Connection Stability: the Bluetooth version 4.1 offers a hyper-stable connection within 10m/33 feet, compatible with all Bluetooth devices such as iPhone 7 / 7plus, 8 / 8s plus, X , S8, SE, Android cellphones, tablets or TV with bluetooth receiver. Convenient One-key Design: just one-key to handle calls and enjoy music. Hands-free calling, last number redialed, third-way calling and incoming calls prompt, all your needs could be satisfied! The music will be auto-replayed to the wireless earbuds after hanging up. Quality Customer Service: 60 days no reason return, 18 month warranty, 24/7 friendly customer service, please don't hesitate to contact us if you have any question about our product and service. SmartOmi Q5 is a Wireless Bluetooth Sports Headphones with Stereo Noise Cancellation and very similar to its previous product that we reviewed. It has a Mic with Hands-free for phone calls on the go so that you don’t have to fiddle with your phone during incoming calls. It also gives crystal clear sound while listening to music. The design of the Q5 w﻿﻿ireless headset is very simple but unusual. It is a kind of ear buds which does not have any cord between the two buds. It comes along with an additional type of ear tips which you can select according to the size of your ear. It fits securely so that you don’t have to worry about earbuds falling while gym workout﻿﻿s or running. Smartomi Q5 comes in a small box which houses the earbuds itself along with dual micro USB cable, a bigger sized ear tip, and a small carrying pouch. This pouch would fit the earbuds, charger and micro USB cable nicely. Otherwise, it would be very easy to misplace all the small things in a bag or a purse. Both the earbuds fit the ear properly. Each earbud consists of a button, a microphone, a light indicator and a micro USB port. The button is for power ON/OFF, hands-free calls or to Play/Pause the song. It’s most convenient feature is the Single key design. With the use of just one button on the earbud, you can pair your phones, answer, reject or end calls and also you can play/pause music. The earbuds will auto-connect and start playing music as soon as you hang up the phone. Also, you can press the LEFT earbud to activate SIRI in standby status and it will also show the LOW BATTERY status. Another feature is that you can share the music with anyone and also you can split the earbuds and connect them to two different phones simultaneously for calling purpose. ​Before starting to use the product, recharge them fully so that the Bluetooth pairing would be easy and convenient. It’s very simple to pair the Earbuds with the phone. First power ON the earbuds by long pressing each button on the earbud without stopping while red and blue light glitter alternatively. The pairing will be completed automatically when the purple light turns ON. Now open Bluetooth on your phone, you will see “Q5” on the Bluetooth screen. Select it to pair the Earbuds with your phone. You are ready to use it. You can also change the language. Press and hold the button of both the Earbuds until purple LED is ON. Double press the buttons to switch the language. The Smartomi earbuds are also used for clearer voice calls with the help of delicate built-in microphone with noise cancellation and echo reduction. This enables you to make a call with crisp voice and noise free surroundings. Some of the features for voice calling includes: Hands-free switching mode, Silent mode, last number Redial, third-way calling and caller voice prompt which will ease your task of calling every day. With the latest and advanced technology and Bluetooth v4.1, its sound quality is better than its competitors and gives lag-free music. Being so small, the sound is very clear and very punchy as well. With the latest Smartphone, you are going to get some crisp, loud and lag free music and also clear calls. With the technology always evolving, we keep getting latest products which are very convenient to use and also make our lives easier. SmartOmi “Q5” is one such product which would easily replace our wired headphones because of its convenience and easy-to-use product. Being so tiny it does have something to offer for music lovers and with noise free cancellation microphone it surely attracts callers.